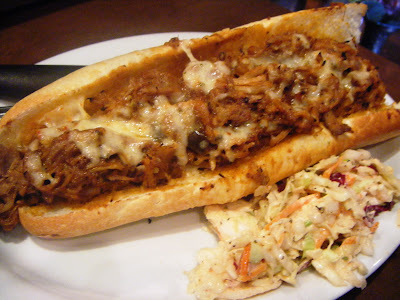 Say hello to a barbecued pork sub, made with meat from a 14-pound pork shoulder. After 16 hours smoking in his Japanese Kamado — precursor to the popular Big Green Egg — that hefty shoulder had shrunk to half its size. Soon thereafter, Clint pulled, sauced and layered the pork on a honking French roll, stuffed it with homemade slaw and presented it to me because, well, because he’s Clint and he loves to share the wealth. 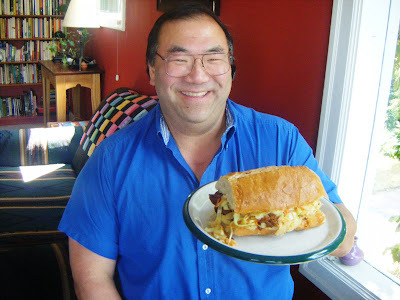 But back to the BBQ Pork Grinder. 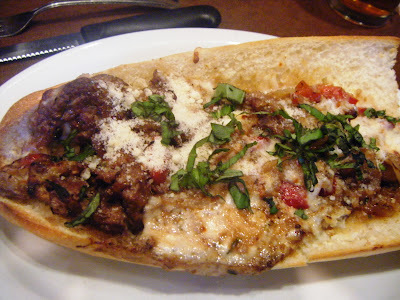 The pork sandwich — like the Gilbano and the Italian sausage- and meatball-laden “SauBall,” with its seriously garlicky marinara — costs $9.95. Each is food enough for two, especially if you save room (and you should) for bread pudding. Unlike Clint, who reserves his booze for his barbecue sauce, Mitch and his mom (that gorgeous broad in the kitchen) kick up their bread pudding with enough whiskey to put hair on your chest. “Hey Mitch! You got any catfish?” yelled a patron from the far corner of the room, as the sand-man kibbitzed with a couple hanging at the kitchen counter discussing the latest act to play at Grinders’ “Hot Jam” Saturday nights. “Fresh for you! It just came in!” Mitch shouted back, keeping his eye on his youthful crew who prepared to fry-up that catfish, dusted with Creole seasoning and slathered with remoulade as a powerful ‘Po Boy — the perfect accompaniment for those evenings when the beer and wine flows and everyone lets the good times roll. Grinders keeps retrained hours: they’re open for “Hang Out or Take Out” Wednesdays through Saturdays from 11 a.m. till 8 p.m., leaving the other days free for private parties. Anybody else been? What’s your favorite hot sand? all are excellent and yummy! Every “sammich” comes with fries and coleslaw inside the layers of meat and cheeses. You can get some on the side too, if you want them. Got to be the Egg Sandwich at Bad Alberts! I’m so happy Steve has put it on the regular lunch/dinner menu so I can have it any day of the week! Fried egg, thick cut smoked bacon and aged chedder on a tender french roll. Simple yet elegant. The Rajun’ Cajun at The Other Coast Cafe in Ballard is hard to beat! How do we get you, me and Clint to start a take restaurant? I can get people to show up, (marketing). of them and market the crap out of it? The pork belly sandwich at the Baguette Box in Fremont (along with their other offerings – try the hand cut truffled fries) is hard to top. I quite fancy a sandwich at the lil deli on east lake. I also enjoy pb on burgers! I’m glad to hear that there are others who find Grinder’s sandwiches a strong enough pull to counter the hesitation to pay for the gas to drive to Shoreline; any interest in starting a food-lover’s carpool to Grinder’s and other favorite eateries in the outer regions? Luckily, however, Grinder’s is outside of the city limits so I can say the best hot sandwich in Seattle is still the #1 at Paseo’s. Other solid contenders are the Other Coast Cafe, Tubs Subs, and the Elliott Bay Pizza Company. Tubs Subs of Lake City does not get enough credit! I also agree that Baguette Box, and honey hole are good options.